As businesses are forced to operate with ever tighter operating margins, managerial oversight of operational costs must be rigorous. One area that sometimes doesn’t get as much attention as other aspects of the operations, is waste. When it does, cost savings are largely focused on managing hauler efficiency, or negotiating lower waste disposal fees. However in order to find more significant operational savings, changes should be made earlier in the process, before the point that a material is considered to be a waste. This strategy is defined as waste minimization. Not only is waste minimization the most economically efficient strategy to manage waste, it is also the most environmentally beneficial. But what does it imply, how can it be integrated into operations, and what savings will it drive? 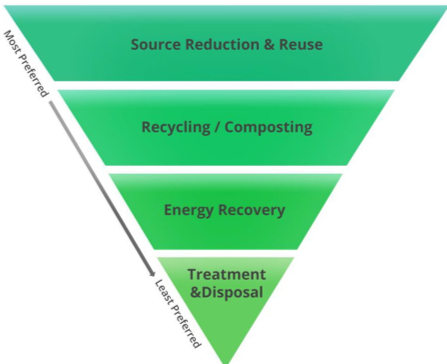 These practices are represented by the Waste Management Hierarchy, a diagram which orders waste management strategies from the most, to least preferred. From the perspective of operational costs, it is ordered by which practices have the potential to generate the greatest financial savings for your business. The hierarchy also takes into account the impact of the different strategies on climate change, air and water quality, and resource depletion. An effective waste minimization plan should therefore concentrate on managing all resources as high up the hierarchy as possible, preventing the waste from being generated in the first place. For many operations, waste disposal costs your business twice – first when you purchase materials, and then again when you dispose of them. Designing out waste from a process can therefore deliver significant savings. This is known as source reduction. Before a meal makes it to the plate, the raw materials are purchased, stored, prepared, and cooked. Any wastage at this stage can therefore cost the business in purchasing costs, energy to refrigerate and cook the food, preparation time, and finally disposal. Improved processes to reduce pre-plate waste can drive savings in all of these areas. Simply, for the same commercial output, the fewer materials that are used, the less waste is produced – and the less it costs in total. Reuse strategies are the next best for waste minimization, and they can also generate significant financial savings. In the manufacturing industry, designing products to enable them to be reused (or recycled) can generate savings in material costs, energy consumption, and waste disposal. When manufacturers implement take-back systems for these products, some of these materials can re-enter their supply chain, generating significant operational savings. It can also be possible to identify reuse partnership opportunities where waste materials from your organization can be used as another’s product. This not only keeps these materials out of your waste stream, but could also generate an additional income stream, although due diligence should be carried out to ensure the recycler can provide documentation to substantiate the process and end market involved. After identifying all source reduction and reuse opportunities, the EPA recommends that waste minimization strategies should focus on recycling. If a business produces significant volumes of recyclable material, for example metal in the construction industry, source separation and recycling of this material could convert a cost into a revenue stream through commodity rebates. Implementing waste minimization strategies will also ensure that your business avoids the financial burden of non-compliance with waste minimization legislation. Many states, counties and municipalities have enacted laws that require businesses to reduce the amount of waste that enters landfills, with fines for non-compliance. Even if these laws haven’t reached your state yet, having a plan already in place will prevent the costs of having to react to those requirements when they do come in. Three elements hold the key to an effective waste minimization strategy. What are the current costs of waste in our operations? Which opportunities have the greatest ROI? What is the feasibility of implementing these opportunities? Analysis of current procurement and disposal costs will establish the baseline for your waste management plan – the starting point upon which improvements can be based. The waste management plan establishes the organization’s waste minimization goals, reporting metrics, priorities, and timelines for achievement. This management plan should be subject to continuous improvement as feedback is received from stakeholders throughout the company. Some companies integrate their waste management plans into their broader environmental management plans, such as ISO14001. This enables them to gain a broader oversight of how their waste management practices influence their environmental objectives, and allows for the use of existing governance structures to ensure that the implemented changes will endure. New technologies can also drive significant waste minimizations efficiencies throughout the operation. In the food service industry, technologies such as LeanPath1 smart meters allow managers to automatically track food waste. This enables them to gain a complete view of their food waste and its financial impact, and utilize the results to inform staff education. Since it is repeatedly seen that what gets measured gets managed better, this improved visibility can drive significant savings. In the construction industry, new technologies such as off-site construction, lean methodologies, and model-based engineering all contribute towards improved construction waste management. Since people are ultimately responsible for whether new systems and technologies are correctly implemented, any investment in new infrastructure must be supported by the appropriate staff training. Your waste management partner should be able to provide you with assistance in establishing the required modules, or in creating training programs to suit your business needs. Source reduction is the waste minimization strategy with the greatest environmental benefit, as it eliminates resource depletion, together with the associated environmental costs of extraction, processing and transporting that material. Where source reduction is not possible, the next best environmental strategy for minimizing waste is to reuse. When we reuse materials, we are conserving their physical state, which required the consumption of resources and energy to reach. For this reason, reuse is environmentally more beneficial than recycling. Finally, since the energy required to recycle a material back into a raw product is less than that required to extract, refine, and process it from virgin material, this strategy also helps to reduce your organization’s environmental impacts. The extraction of aluminum from its ore, bauxite, requires 157 MJ (megajoules) of primary energy per kg. Open-pit mining of bauxite requires vast areas of land to be cleared, and can result in the contamination of surface water with heavy metals such as arsenic and mercury, present in bauxite sediment. In comparison, recycling one ton of aluminum back into packaging or building material requires just 7.85 MJ of primary energy per kg. This represents a saving of up to 95% of energy, with an associated reduction in the carbon footprint of the process. The resource depletion and environmental contamination associated with extraction are also eliminated. General awareness of environmental products and services is increasing. With this, a growing number of employees want to work for organizations that have robust environmental practices. This has been shown to improve recruitment success and staff retention, and in turn, reduce recruitment costs. Consumers are also increasingly choosing to purchase from brands that they perceive to be environmentally friendly. In B2B, procurement exercises often request information on their suppliers’ strategies for reducing their carbon footprint. Evidence of a waste minimization program can therefore help your organization to be better positioned for these opportunities. There are several third party tools available to assist your organization in its waste minimizations objectives. The EPA provides a range of resources for businesses of all sizes through its WasteWise program. The EPA created the Waste Reduction Model (WARM) to help organizations track and voluntarily report greenhouse gas (GHG) emissions reductions related to their waste management practices. WARM calculates and compares the GHG emissions of baseline and alternative waste management practices, including source reduction, recycling, composting and landfilling. This enables organizations to measure the impact of their waste management decisions and to track progress over time. The General Services Agency (GSA) created this database to help Facilities Managers and Purchasing Agents make their purchases and operations more environmentally friendly. Any organization can use the resource to find out what sustainability criteria they should seek across a range of product categories. It can also be used to search for and purchase products with recycled content and other environmental certifications. Your waste partner is well positioned to identify opportunities to reduce waste volumes. If your organization is large, they can carry out waste audits to identify source reduction, reuse, and recycling opportunities as part of your waste minimization program. Results from this exercise will enable them to create customized waste minimization programs that reduce your operational costs and help meet regulatory requirements. A vigilant waste partner may even be able to identify cost saving opportunities in the form of partnerships between customers with specific material needs, and others with the same material present in their waste stream. A prestigious national retailer was only managing to recycle 30% of their waste, with tons of valuable recyclable material being sent away every day as trash. NWA worked with corporate to introduce site-specific recycling strategies to all store locations, resulting in an increase in company-wide recycling rates to 50%. The recycling service was customized based on the needs of each location, market availability, and ease of use. NWA provided the stores with educational information to support the new strategy, showing employees how to recycle effectively. This increase in recycling rates has helped the business to save an additional 50,000 metric tons of CO2 per year, the equivalent of taking 11,000 cars off the road. An effective waste minimization strategy can drive significant operational cost savings, especially when source reduction strategies are implemented. But the benefits don’t end there – it also presents your organization with the opportunity to improve its reputation among staff and customers, and protects it from the advancing reach of legislation. At the same time, your organization will be reducing its environmental footprint and helping to pass on a better world to the next generation. With waste minimization, the opportunity exists to change waste for good.